Home prices continued an upward trend in the first half of 2015 while inventory remained low. The first half of the year saw a merger and prominent commercial sales. Home prices in the San Diego metro area were up 4.77 percent in March from March 2014, according to the S&P/Case-Shiller Home Price Indices. Nationwide, prices were up 4.14 percent over the year. April data from the local Multiple Listing Service show single-family home prices for 2015 year to date up 6.2 percent from 2014. The median sales price in April was $520,000 for detached homes, and $344,250 for attached homes. Listings of previously owned homes on the Multiple Listing Service topped 6,500 in San Diego County in April, but housing stock remains an issue for buyers, with only about two and a half months of inventory on the market. A healthy inventory level is five to six months. Homes sold in about 40 days in April. 6266 Camino de la Costa in La Jolla was sold for $14.3 million on March 9. Dane Soderberg of P.S. Platinum Properties was involved in the transaction. Photo courtesy of Dane Soderberg. The City Council approved the controversial mixed-use development for Carmel Valley -- but after a successful referendum campaign, rescinded its vote. In response to legal threats, Kilroy Realty Corp. reached an agreement with opponents of the dense project to allow for greater public input for One Paseo as it is redesigned. The new design will result in half the traffic, office buildings that are seven stories instead of nine, and 30-foot setbacks. Community planning groups had feared they were losing importance in the planning process. Lenders issued notices of default to 466 borrowers in May, down 11.4 percent from April 2014; and trustee deeds were filed on 209 properties in April, down 10.7 percent from April 2014, according to the San Diego County Assessor's Office. *Donna P. Boyton and Melissa B. Cunningham, trustees, sold a house at 6266 Camino de la Costa in La Jolla for $14.3 million to Sea Spray Holdings LLC on March 9. It was sold by Dane Soderberg of P.S. Platinum Properties. 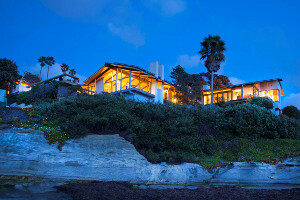 * YAZ LP sold a house at 310 Dunemere Drive in La Jolla to William H. Rastetter, trustee, for $11.4 million on March 13. It was sold by Drew Nelson of Willis Allen Real Estate. * Paul R. Schimmel, trustee, sold a house at 9822 La Jolla Farms Road to Gary A. Kraut and Bettie McCarthy-Kraut for $9.05 million on Feb. 18. It was sold by Cher Connor of Berkshire Hathaway HomeServices. -Compiled by Katie Thisdell, The Daily Transcript. Rancho Bernardo-based Excel Trust Inc., which owned 38 shopping center properties consisting of 7.2 million square feet from California to Maryland, was bought by Blackstone Property Partners LP for about $2 billion in an all-cash transaction in April. Earlier this spring the parent company of DTZ, which had previously acquired the Cassidy Turley commercial brokerage firm a year earlier, announced it would be acquiring Cushman & Wakefield. Locally based shopping center portfolio owners didn’t just sell themselves to other companies, they also made some big acquisitions. The 285,000-square-foot La Costa Town Square shopping center under construction was just one piece of an $830 million portfolio acquisition by Carlsbad-based Terramar Retail Centers in January. The transaction came due to a forced divestiture of certain assets resulting from the merger between Safeway and Albertson’s supermarket chains. The sale came within weeks of Haggen Inc., a Washington state grocery chain, announcing its planned acquisition of 146 Vons and Albertsons stores -- including 25 in San Diego County -- also part of Safeway's forced divestiture of stores and/or centers. A couple of prominent hotels were among the top transactions this year. Douglas Manchester, who just sold the Union-Tribune for $85 million in May, sold the Grand Del Mar Resort and golf course for a total of $228 million in two transactions in April. The buyers were a joint venture of Blum Capital and the Fairmont Hotel & Resorts chain. Another notable hotel transaction this year was the $118 million sale in May of the 419-room Hyatt Regency La Jolla that makes up the lodging portion of The Aventine development in North University City. The buyers were a joint venture of Walton Street Capital LLC of Chicago and JMA Ventures of San Francisco. The sellers of the Hyatt were Hotel del Coronado owner Strategic Hotels & Resorts, which owned a 53.5 percent interest in the Hyatt prior to the sale and GIC Real Estate Pte Ltd., an entity of the government of Singapore that owned the remaining interest. In one case, Alexandria Real Estate Equities' (NYSE: ARE) continues to expand the Illumina campus to an eventual 900,000 square feet in the University Towne Centre area. Another example of strength was the $83.88 million May acquisition of the 288,454-square-foot, four-building Towne Centre Technology Park in the UTC market by a unit of BioMed Realty Trust (NYSE: BMR). The seller of the property was a unit of Arden Realty, which paid $152.5 million to acquire these same buildings in August 2007. The buildings occupy 24.6 acres and are vacant. BioMed’s plans include converting and upgrading the buildings to include Class A laboratory space. BioMed is also the developer of i3, a 300,000-square-foot speculative life science development in the 4700-block of Executive Drive. -Compiled by Thor Kamban Biberman, The Daily Transcript. Visit sddt.com/realestate for our “Deal of the Week” column and our Source Sales Tools at sddt.com/databases for information on home sales, leasing notes, trustee sales and more.